Recruitment Process – HR Recruitment – Recruitment Process Analysis – Recruitment Process Framework – A standard recruitment process within an organization allows for an effective and efficient hiring of candidates including employee onboarding. Hiring of individuals and broader talent management are key parts of company’s HR strategy. 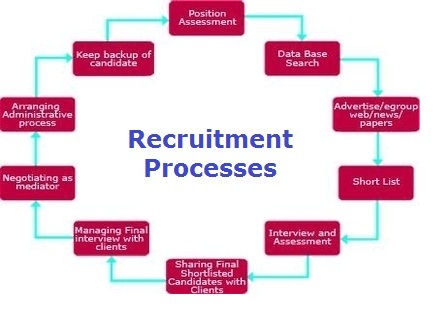 Recruitment HR processes include position assessment, data base search, advertisement of roles, short listing, interviewing, sharing final shortlists, conducting final interviews, negotiating offers, arranging on-boarding, keeping backup candidates. The hiring processes are usually conducted by Recruitment officers, part of a Recruitment Centre of Excellence (COE). Recruitment Process - this diagram visually depicts one of the common business frameworks, used by leaders to develop company strategy, tactics, models and approaches. Motivation, defined in relation to employees in the workplace, is the extent to which persistent effort is directed towards a goal. The different factors motivating employees at work can be further subdivided into two broad categories – extrinsic and intrinsic. Extrinsic motivation stems from the work environment external to the task and it is usually applied by others (e.g. regular salary, fringe benefits, cash awards for excellent performance, etc.). Alternatively, intrinsic motivation, is thought to result from the direct relationship between the worker and the task and to come from within (e.g. one’s interest in the task, feeling competent, recognition, etc.). While certain motivational factors fall clearly within these categories, there is some degree of overlap. For example, receiving a compliment or a promotion from a boss are both examples of extrinsic motivation. At the same time both are targeted at eliciting a positive feeling of competence and/or recognition of one’s achievement, both of which fall under the intrinsic motivation category.Thus, a given motivational event can be part-intrinsic and part-extrinsic. It is also true that most of the employees are motivated by a variety of factors which are likely to come from both categories. Managers need to be aware of the diversity in the workplace and realize that the same conditions will not motivate everyone. Flexibility to employees’ needs is especially important given the increasing productivity demands placed on modern organizations. To stay globally competitive organizations need to replace rigid systems of rules, regulations and procedures by higher levels of initiative among its employees, which would help deliver greater levels of attention to customer needs. This, of course, requires that employees be motivated to add value by looking for ways to improve their performance as opposed to doing a base-line or even sub-par job. How does a manager, then, determine what kind of motivation would work best for his or her employees? A few conclusions supported by a review of motivational research may help guide the search for optimal motivators. 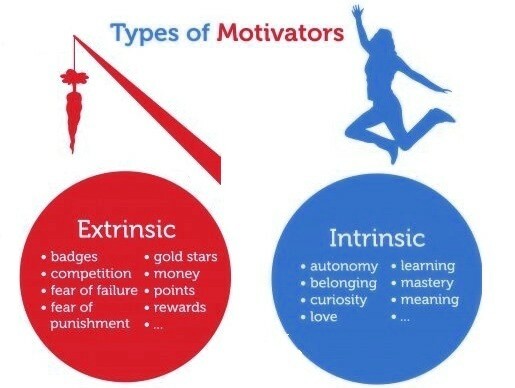 First, employees motivated by intrinsic factors feel more in control of their motivation, as opposed to those motivated by extrinsic rewards. This results in more effective performance, especially on complex tasks. Therefore, if a manager’s goal is to solicit a performance improvement that may require the employee to identify and analyze possible deficiencies in their current job, the manager would need to ensure that the employee is intrinsically motivated. This conclusion relates to the second fact discovered by a review of motivational research. It has been shown, that availability of extrinsic motivation may reduce the intrinsic motivation stemming from the task itself. In other words, when employees believe that they perform well as a result of external rewards, it makes them feel less in control of their own behaviour diminishing the power of the intrinsic motivation. However, such negative effects of extrinsic rewards occur only under limited conditions and are avoidable. Moreover, in line with the idea of the blurred line between extrinsic and intrinsic motivation categories, when extrinsic rewards are seen as symbols of achievement they increase task performance. Thus, both reward types are important and should be combined to achieve greatest employee motivation in the workplace. Motivation in the Workplace - this diagram visually depicts one of the common business frameworks, used by leaders to develop company strategy, tactics, models and approaches. Change Management – Change Management Analysis – Change Management Framework – Change Management Business Methodology – Change management is a step-by-step process that enables an organization to achieve transformation. Change is painful for the organization, its employees and culture. While in transition, many employees are unhappy, and communication and motivation become key in making sure everyone is aligned with the change and its impact (e.g. technological or process change). Below is an examples of a change management process. Change Management - this diagram visually depicts one of the common business frameworks, used by leaders to develop company strategy, tactics, models and approaches. HR Strategy – HR Strategy Analysis – Human Resources Strategy – Hr Strategy Framework – HR Strategy Business Methodology – hr strategy model is essential for the development of talent and leadership within a company, key to the long-term success of a company. Human resources is one of key business functions and its strategy stands on the following key pillars: leadership development, performance management, talent management, employee engagement and succession planning. Below sample images are examples of HR Strategy used in business management. HR Strategy - this diagram visually depicts one of the common business frameworks, used by leaders to develop company strategy, tactics, models and approaches.